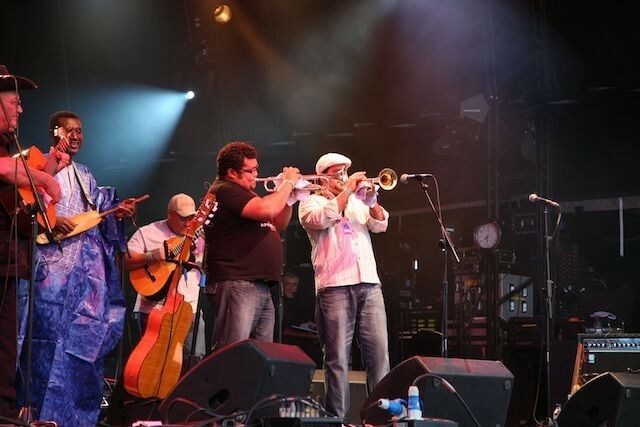 This year’s Womad Festival at Charlton Park had - as ever - some big-hitters amongst the headliners, the ‘must-see’ acts. For some it would have been Baaba Maal or Alpha Blondy, for others Taraf de Haidouk, Vieux Farka Touré, Ebo Taylor or Booker T. However for me, heading the top of the list of unmissables was the band that almost-never-was, the malicubano maestros that are AfroCubism. "truly a heavyweight act ... the cream of Mali with the coffee of Cuba." Made up of one of Cuba’s top acts, the guajiro Eliades Ochoa and his band Grupo Patria - legends in Cuba and the world long before AfroCubism, even before Buena Vista Social Club - and the best of Mali’s musicians (Bassekou Kouyate, Toumani Diabate, Djelimady Tounkara and more), this was truly a heavyweight act. As I’ve said before, AfroCubism brings together the cream of Mali with the coffee of Cuba. For an in-depth review of their debut album and some more detailed background to this amazing band click here: (www.worldmusic.co.uk/afrocubism_afrocubism). "a sea of thousands of waiting fans"
Leaving WorldMusic.co.uk’s photographer at the front of the stage, I took up position just in front of the soundbooth amidst a sea of thousands of waiting fans. Everyone knew that this performance was going to be one to savour. 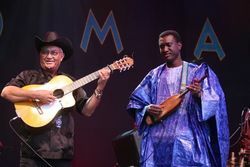 The band trooped on stage, Eliades Ochoa all in black and in his trademark stetson hat, Grupo Patria in their usual relaxed clothes and then the Malians - most dressed in traditional clothes: Bassekou Kouyate and Djelimady Tounkara resplendent in shimmering blue robes, Toumani Diabaté in white and gold, Fode Lassana Diabaté in ochre, Yacouba ‘Baba’ Sissoko Tama in orange and diminutive singer Kasse Mady Diabate in deep indigo and a little pork-pie hat. And they were off… straight in with a track of Cuban origin. I didn’t catch which one because sadly many of the tracks were not announced during the performance. Ochoa addressed the crowd in Spanish - and luckily there were enough Spanish speakers there to understand: ‘How you feeling?’: “¿Malo, Bueno o Regular?” (Bad, Good or So-So?). “BUENO! !” came the overwhelming reply and from that moment on the audience were irrevocably in AfroCubism’s pocket. Supergroups for me had always been something associated with the 70s that went out of fashion as they were relentlessly devalued, but if ever a band deserved the title then it’s this one. 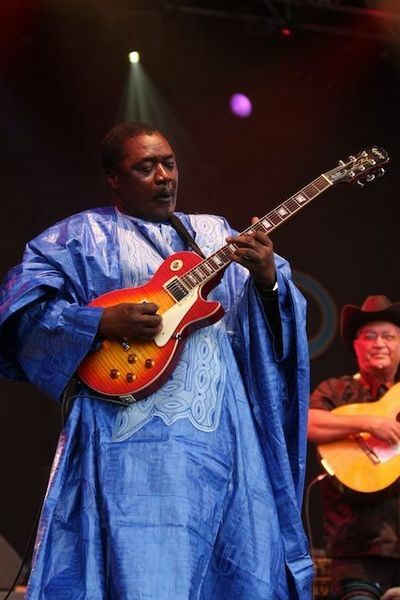 Every Malian is not just an acknowledged master in his own field but a band leader and star in his own right too. And then of course, there’s Eliades Ochoa, the only ‘big name’ Cuban on stage, but what a name! He’s assured his place in the history books with the instantly recognisable “Chan Chan” alone - but with the Grupo Patria behind him, the Cubans were an unstoppable machine. Shortly into the set the first in a long line of sound problems held them up. This seemed to be something repeated often around Womad this year (with the notable exception of the Radio 3 Stage) and is one of the few stains on what is usually a remarkable festival. I don’t think even the band could quite believe what was happening at times, and at one point were having to almost bring the music to a halt as Toumani tried to shout instructions to the sound engineers. Whilst waiting for the problems to be resolved, Bassekou Kouyate played alone on his ngoni whilst the rest of the band encouraged the huge crowd to put their hands in the air and twinkle their fingers - whether it was a case of ‘many hands make light work’ or Tinkerbell’s fairy dust, I don’t know, but it got us all through a sticky patch. 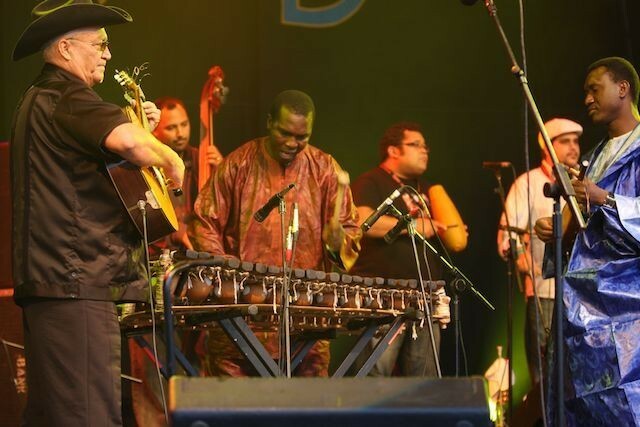 And so the band played on, going into the bucolic, trance-like “Al Vaivén de mi Carreta” (a cuban guajira) and featuring a blistering solo by Malian balafon player Fode Lassana Diabaté. “AfroCubism” on World Circuit), “Djelimady’s Rumba”, a track which usually features the rippling waves of Tounkara’s electric guitar. In this version Grupo Patria’s trumpeters (Alain Dragoni & Lennis Lara) stepped up to a microphone and started blowing in unison for what should have been the sound of the horns of heaven announcing some epiphanic musical revelation; but instead what we got sounded like two toy trumpets being amplified through a 1930s wireless set. Uhhh? I knew it wasn’t anything to do with the musicians whose abilities are impeccable (just listen to the album! ), but why couldn’t the sound engineer get it right? In fact it took until almost ¾ of the way through the entire set until it finally all settled down. I understand it’s a large band, a complex mix of mostly acoustic instruments (always more difficult to mike and monitor, etc), and a mix of instructions in French, Spanish and English but for ****’s sake this is Womad - we expect better! The band of course were brilliant and acted like true professionals, but I felt like they’d been really let down at what is a major gig at the world’s premier world music festival. Anyway, all the front line musicians took solos and the musical heat started to turn up, Djelimady breaking off in the middle of his to divest himself of some clothes and start up again even more fired up. The man was burning in all ways. A good bongo solo was followed by a great tamani (talking drum) and calabash solo by Baba Sissoko. The calabash was half a very large dried gourd turned upside down on a table/resonating box(?) and thumped with his fist - it produced a huge bass sound totally out of proportion to expectations! "Toumani plucked his strings with such verve and attack you’d think his life depended on it." Into the Cuban tune “La Culebra” (The Snake), during which people were punching bouncing balls all over the crowd, which I found very frustrating; when you’re this far back from the stage a number of plastic white and orange beach balls randomly crossing your sightline is very distracting. 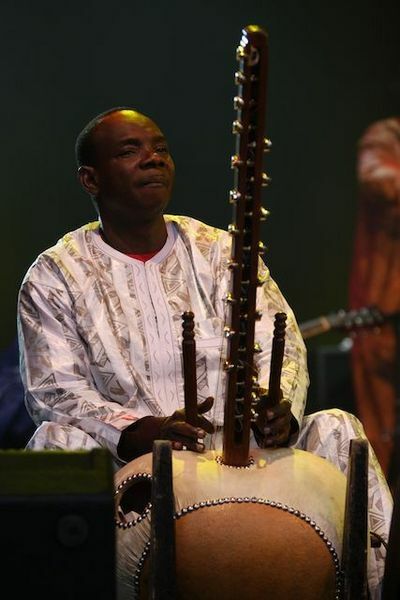 I’m not sure what the next tune was but it featured yet another brilliant balafon solo and then Toumani Diabaté (at the top of the tree for kora players for some decades now) turned in a stunning solo. He’d settled in now and turned it up to Gas Mark 6! 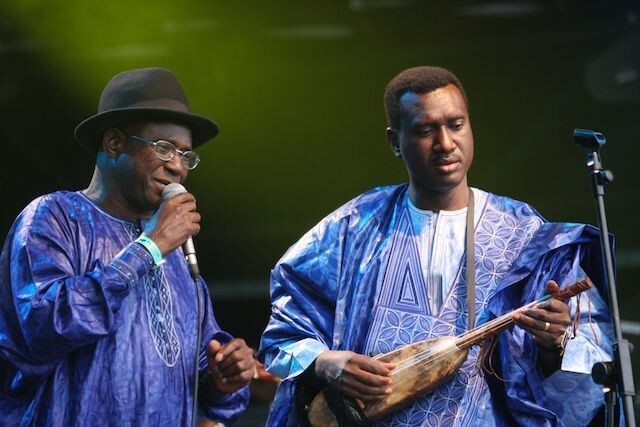 As big tall Bassekou and little Kasse Mady rocked together, swaying by side, Toumani plucked his strings with such verve and attack you’d think his life depended on it. Djelimady took up the baton and delivered another solo of electronic magic whilst wearing the stetson which he’d playfully nicked off Eliades’s head! "revelling in each others artistry and the rapt appreciation of the crowd"
Throughout the concert AfroCubism kept on asking us whether we were happy - it was apparent that they were! The guys on stage were clearly enjoying every second on stage and very obviously revelling in each others artistry and the rapt appreciation of the crowd fanning out from the stage. There was a lot of joy in that arena. One of Grupo Patria came to the front of the stage and starting wining and gyrating his - shall we say, rotund - body for the audience’s delectation and delight. There were still problems with the sound at this point, Bassekou’s usual sparking ngoni sounding muddy and indistinct, although a popping bongo solo by the dextrous Cuban percussionist (Jorge Maturell) was as crisp as a packet of Walker’s Ready Salted and Baba Sissoko’s amazing abilities on the tamani had the crowd completely involved in a mass call-and-response sequence. "These guys were practically spitting bullets!" 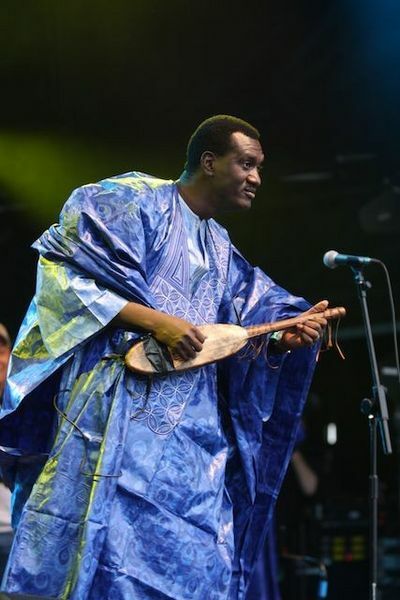 The highlight for me though was the Toumani Diabate-penned track “Jarabi” sung by Kasse Mady Diabaté. 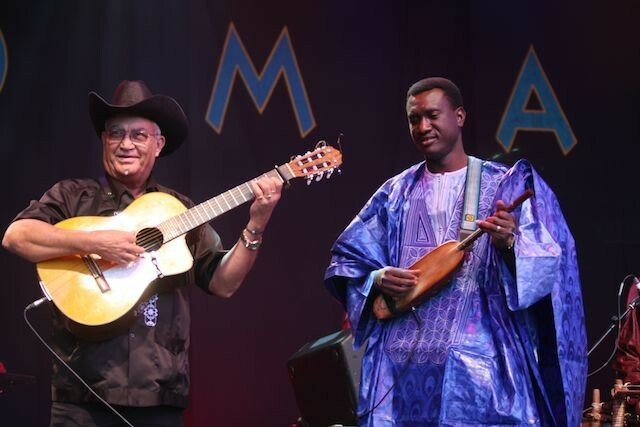 By this time we knew we were well and truly in the presence of master musicians, especially the duet between Toumani Diabaté and Bassekou Kouyate. Forget “Duelling Banjos!! These guys were practically spitting bullets! The band played so fast and hard after this that even when all the lights on stage went out they still continued ripping it up in darkness! As they finished the tune to rapturous applause, the lights came back on again. And a big cheer with it. "AfroCubism made thousands people very happy indeed." To the strains of a super-fast guajira “A La Luna Yo Me Voy” the crowd turned into full-on dance mode and partied to the very last drop. There’s no doubt, that despite a poor sound and technical problems, the sheer musical brilliance of AfroCubism shone through and made thousands people very happy indeed. If you get chance at all, see this band! I can’t recommend them highly enough.